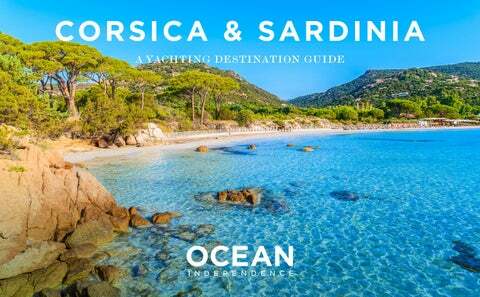 YACHTING IN CORSICA AND SARDINIA A heady mix of seductive beaches, emerald anchorages and evocative culture - Corsica and Sardinia are a genuine yachting paradise. With vibrant hillside towns dotted with chic boutiques, rugged landscapes, great restaurants, picturesque swimming spots and an immersive ancient history - these charming islands offer the perfect cruising grounds for a luxury yacht charter. erched high on the cliff edge, Bonifacio is a simply spectacular Mediterranean town. Thanks to its magnificent coastal setting, deep natural harbour and mountainous backdrop, you can best appreciate the view when approaching by yacht. Clusters of pastel houses cling atop the towering striated rocks that plunge to the sea below. The old town, with a labyrinth of narrow streets and historical buildings, is a fascinating place to wander; donâ&#x20AC;&#x2122;t miss delicious local fare at one of the excellent restaurants. Sea caves that can only be accessed from the water, such as the Grotte de Sâ&#x20AC;&#x2122;Dragulinu, are definitely worth a closer look. nown as the St Tropez of Corsica, Porto Vecchio is a mixture of old and new, with the haute ville presenting a well-preserved example of Genoese medieval architecture. Flanked by cafĂŠs and restaurants, the winding streets around the atmospheric main square are a charming place to watch the traditional Corsican evening promenade. Beachside paradise is found on the vast golden expanse at Plage de Palombaggia, with sparkling waters, fragrant pines and stunning views over the Iles Cerbicale. jewel in the chain of the Lavezzi archipelago, Cavallo is known as the ‘Mustique of the Med’ and is a well-kept secret. The shape of a jigsaw piece and fringed by clusters of weathered round boulders in many hues, it is no wonder the Romans used Cavallo granite for their sculptures. A renowned hideaway for visiting celebrities, there are no cars – only golf buggies and bicycles. An oasis of dreamy beaches are set in natural wild coves, where the seabed radiates incredible hues of turquoise in the sunlight. ike a more rugged version of the Caribbean, the seven main isles in the Maddalena National Park form a stunning archipelago. On La Maddalena, the buzzing town is full of character: head to lively Piazza Umberto where locals socialise amidst ochre-hued restaurants. Famed for pristine beaches backed by fragrant shrubs, there are ancient ruins and fortifications dotted around the rocky terrain. Uninhabited Spargi offers relaxed swimming and snorkelling in amazingly crystal-clear waters - head ashore at Cala Corsara to wander the powder-white sands and admire the curious pink granite rock formations. istinctly cool and exclusive, Porto Cervo is a hub of the internationally renowned Costa Smeralda. Pastel-hued homes with a backdrop of rolling hills ring the aquamarine port, while the elegant old town claims charismatic allure and chic boutiques. Wander at leisure, watch the world go by at pavement cafĂŠs and purchase native delights such as myrtle liqueur or olive oil Caribbean-worthy talcum-white sands act as a magnet for beach lovers, with quiet bays offering countless playgrounds for water sports. Combine laid-back style with Italian glamour for drinks at the Yacht Club Costa Smeralda Aqua Lounge, exuding an undeniably elegant atmosphere. ashionable Cala di Volpe boasts an incredible wide bay fringed with pristine beaches and clear turquoise waters â&#x20AC;&#x201C; simply a perfect spot for snorkelling and water sports. Explore the pretty village itself, regularly frequented by celebrities, and enjoy sunset cocktails on the terrace at legendary Hotel Cala di Volpe, considered one of the best hotels on the Costa Smeralda. Nearby, the tiny beach of Spiaggi Capriccioli has a beautiful setting and is favoured by locals as a haven of tranquillity. t 4km long and 1km wide, the second largest rock in the world and the smallest kingdom, vertiginous Isola Tavolara is a limestone and granite landmass, rising to 560m at the peak of Monte Cannone. Velvet beaches, shallow waters and hiking paths can be found ashore, while dive sites strewn with corals and the famous Grotto Ghigliottina caves are only accessible by boat. Privately owned, Isola Molara, is a circular, rugged and protected marine park, surrounded by calm, crystalline pools and easy anchorages. Thousands of birds nest within the cliffs, while goats take shade under wild olive trees: this island is a picture-perfect scene of unspoiled nature. At Cala di Chiesa, wander through the medieval village of Gurguray and join the coastal hiking path around the isle. Nearby, the tiny rocky bluff of Molarotto is surrounded by beautiful turquoise anchorages.